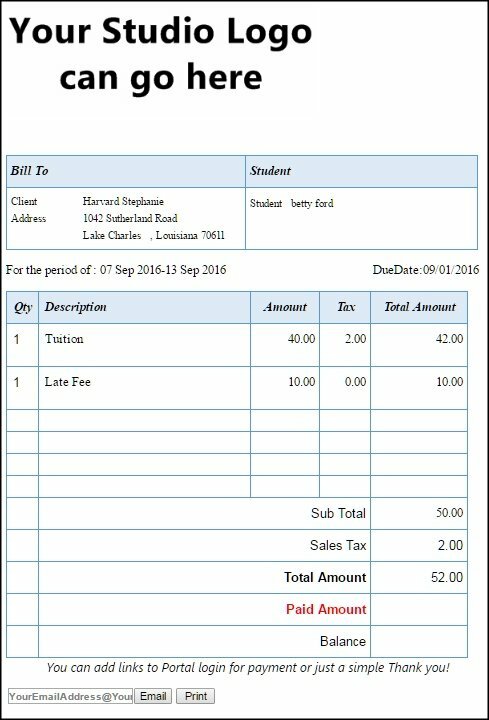 To print or email each invoice separately go to Billing -> View/Pay Invoices. Filter the list of invoices to show only the invoices that you wish to Print or Email. Each line will be a separate page and a separate email addressed to the Bill to guardian for the student. To print the invoice(s) listed- Click the Print Invoice button on the top. *To email the statements to a different email address than the bill to guardian, you may enter the address at the bottom of the Print Invoice preview. Keep in mind all invoices in the print preview will be sent individually to the email entered. If you wish to Email the individual Invoices to each Bill to Guardian once the invoices you wish to send are filtered for, click Email Invoices. To print a collection of invoices – here is a way to export and print using Excel.